It is unbelievable how quickly a month has gone by. And more importantly, how quickly 5 months have gone by. This month Dave and I are heading to the South of Italy and now I am really counting down the days. So, without any ado, here is what was In My Kitchen October 2013. In My Kitchen October 2013 …. 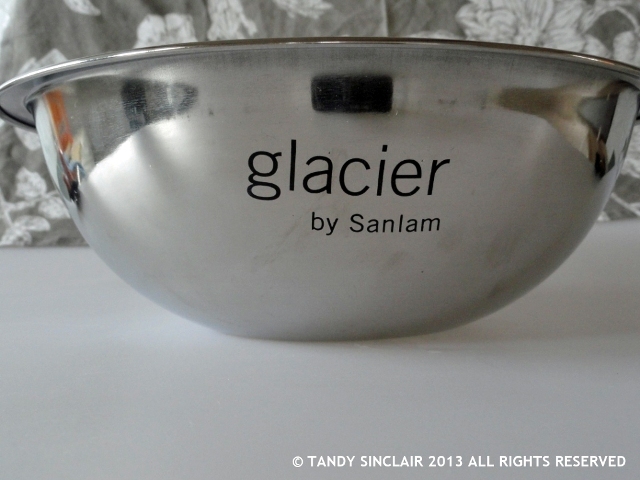 is a bowl I received at the Taste / Glacier bread making event. I was an invited guest and still got to go home with a goody bag full of wonderful treats, including this bowl. 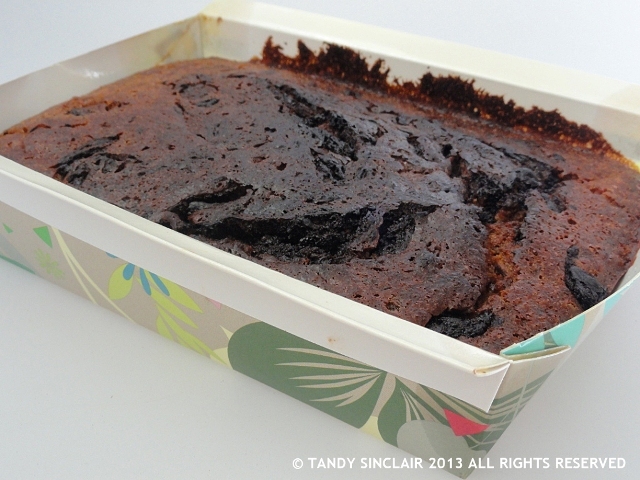 is the Amarula cake I baked to test out my disposable baking tin. I was quite impressed with the way the cake come out of the tin, and this is certainly a great way to take a home made gift to someone. is my first batch of home made spaghetti using my pasta extruder. I am so pleased with how this works and I am looking forward to experimenting a bit more and then sharing a recipe with you. 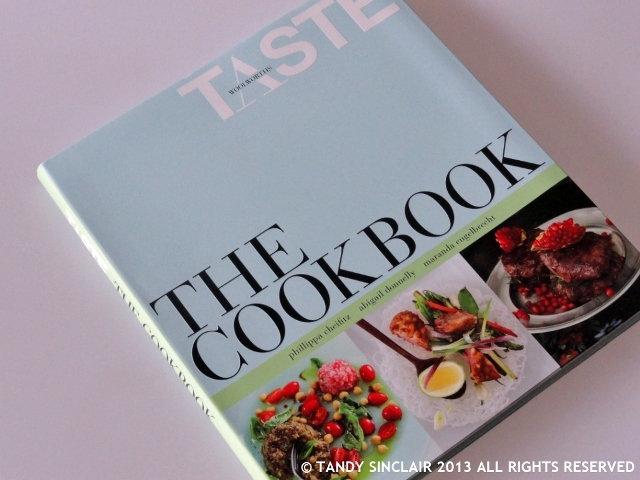 is a signed copy of the Taste recipe book. Abigail hosted the bread making day and she signed this copy for me. 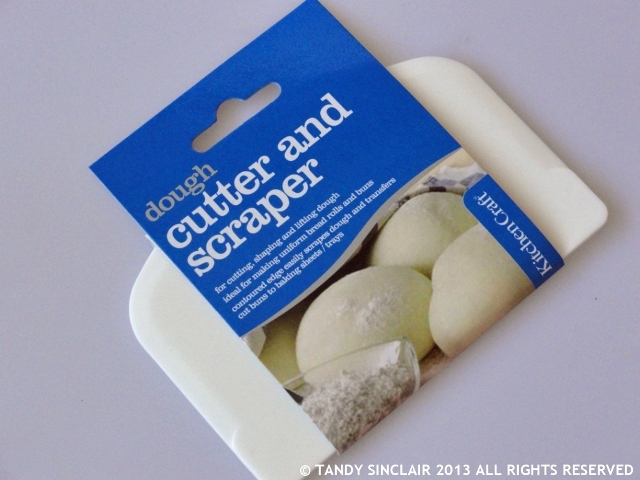 is a dough cutter and scraper. Summer is nearly here and so I will be back to making sourdough bread by hand soon and this is a handy tool to have. are goose eggs! My friend John uses ducks and geese to keep the snails in check on his wine farm and he incubates eggs to keep his population steady, and for his show ducks. He also sells ducks, and the eggs at the estate. I was given these eggs as a hostess gift and we have had 2 for breakfast – the yolks are huge and I am going to make pasta with them soon. 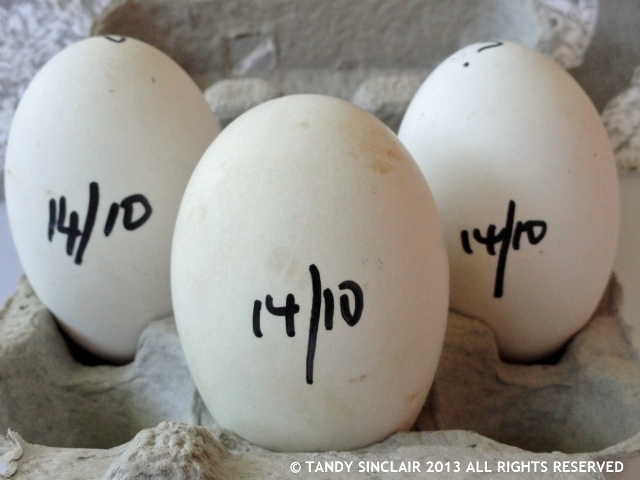 The dates on them are the date they would have hatched had they been put into the incubator. I loved your pasta. I don’t have an extruder so I never make spaghetti, only linguini or flat varieties. I dry mine on my ceiling airer which causes comments from visitors who don’t realise what it is! Those goose eggs look SO rich! I’m quite jealous. I like the look of that disposable cake tray. I’ve never seen one before. I’ll have to look out for them. Thanks for showing us around! thank you for the visit 🙂 I hope you find some of the cake trays! I like the look of that dispoable cake tray. I’ve never seen one but I suppose it makes sense. It’s like a baking cup or muffin wrapper. I’ll have to keep my eye out. Thanks for showing us around! 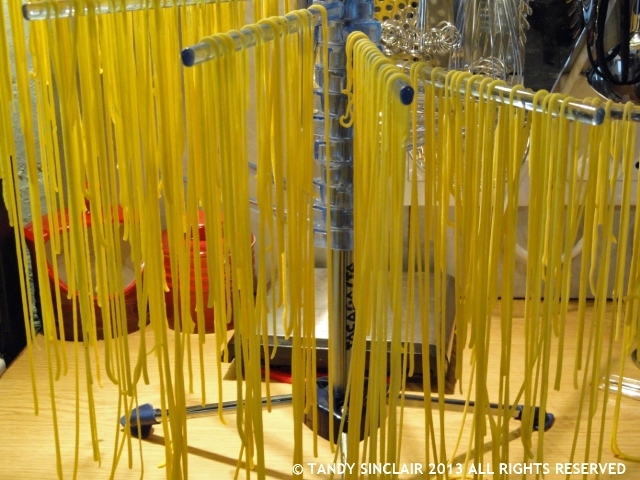 Tandy, your homemade spaghetti looks wonderful! I can only imagine how rich and delicious it’ll be when you make it with goose eggs. Have fun in Italy! Your kitchen is always filled with goodies…that pasta looks great. Have a wonderful time on your trip. Had to google Amarula to learn that it’s a creamy pale brown liqueur. Your Amarula Cake sounds divine! And that disposable cake pan is a brilliant idea! Your home-made pasta is a marvel to me. And goose eggs! How grand! Thanks for sharing! I have never tried a goose egg – is the flavour any different to a chicken egg?! I’m starting to get a bit inspired by all the sourdough bakers around, maybe it’s time that I have another crack at it (it didn’t end well last time… I was a bit neglectful of my starter!!). That pasta hanger is a riot! How fun! I could not make pasta without it! I’ve made pasta with my hands and find it so time consuming — need a cool gadget!! It is very time consuming by hand! I bet those eggs are soo good! Have a great trip. On holiday again–i am sure you looking forward to it. G’day and thank you Tandy for this month’s kitchen view! LOVE homemade pasta! And disposable baking tins save so much time too! I used a dough scraper for the first time when I did the bread making course and they work a treat! We are going to Tropea and Sicily 🙂 Anywhere that you can recommend? Lovely things in your kitchen. I do love goose eggs, they’re normally around here Easter time and coincide with asparagus – I love dipping the spears in one of those rich yolks (soft boiled). Pasta will be wonderful with them! Those eggs are a treasure! And I like the stainless steel bowl- although I used clay bowls for making bread- there is supposed to be a bad reaction from steel to sourdough so I keep it for making cake and cookies! Thanks for sharing- always love your kitchen! Hi Tandy. Your pasta looks great, so yellow. You must be using fab eggs. The dough cutter and scraper is a great tool. I have two in each kitchen. I am so impressed at your homemade spaghetti! Definitely a fabulous thing to have in your kitchen. Oh how exciting making your own spaghetti! I’ve never done that and didn’t realise that you could do it at home! 😀 I always thought that it required a complicated extruder. Tandy you always have so many awesome goodies in your kitchen every month. Lovely October thingies. I’m really impressed by your spaghetti and that disposable baking tin is a real win!